P.F. 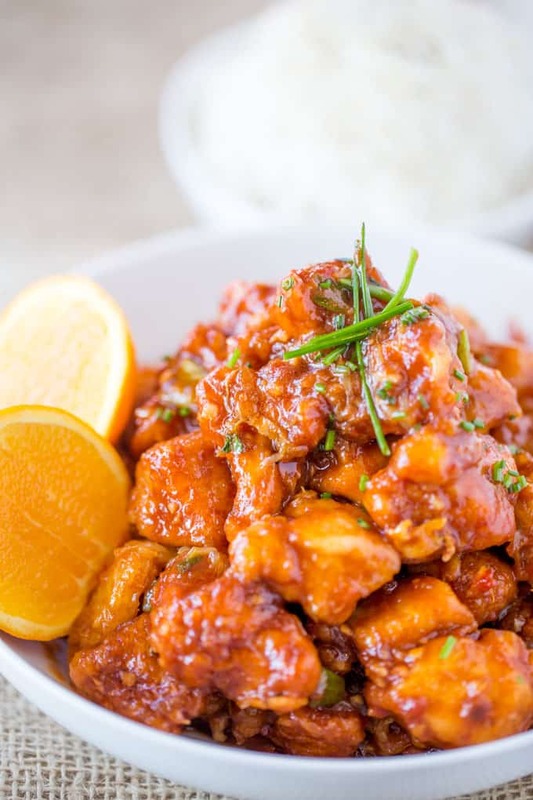 Chang’s Orange Peel Chicken is crispy, spicy and sweet, with notes of orange flavor and even healthier than the restaurant version! P.F. 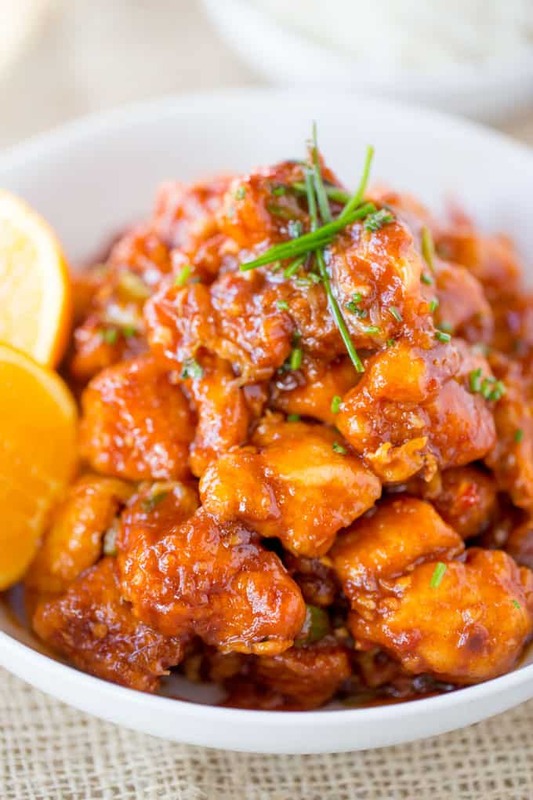 Chang’s Orange Peel Chicken is one of the dishes we always order at P.F. Chang’s because like most people orange flavored stir fried Chinese American food is pretty much always going to be a winner! In close second would be Orange Peel Beef because well… yeah. This was one of my first posts on the blog back in 2015. It was a recipe I couldn’t wait to post and since then I’ve gotten better at taking photos. So there is a fun new set of photos for the recipe. Same delicious flavors though! 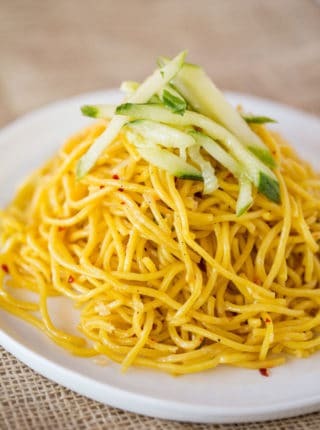 This dish is the first I ever tried there, and as I am sure you know about me (or will learn soon enough) when I love a dish, it becomes my go-to. 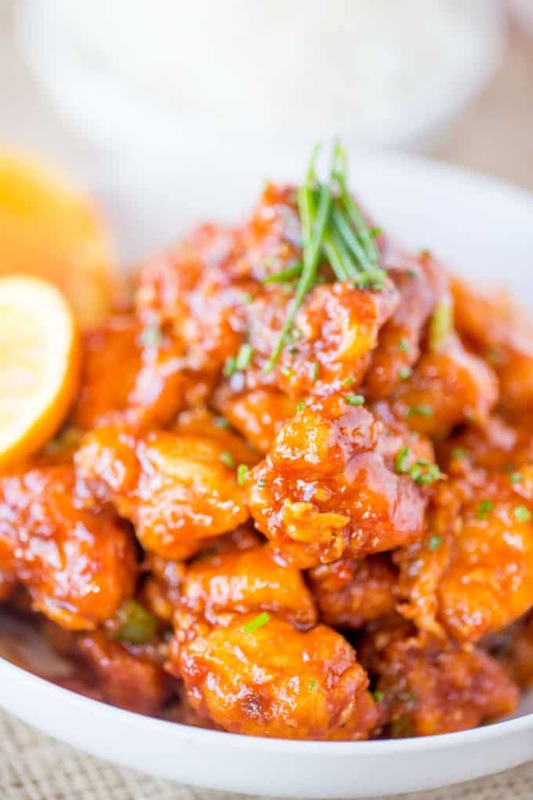 At PF Chang’s it is this Orange Peel Chicken, at The Cheesecake Factory it is the Spicy Cashew Chicken (with no cashews). 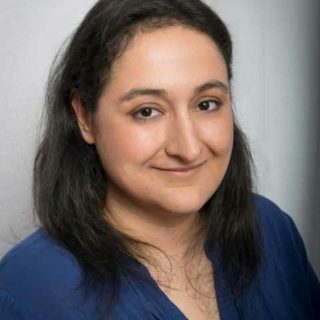 I am a loyal fan, only deviating from my favorites to taste a bite of my husband’s dish. He is, luckily for me, the opposite of me when we go out to eat and loves to try new things. So I end up with the best of both worlds. 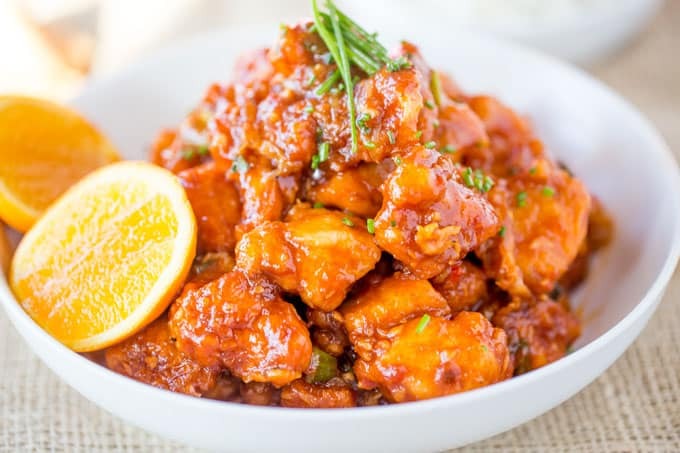 The one change I made to this recipe is that I skipped the breading and deep frying process and used cornstarch in place of flour to keep the chicken as crispy as possible. 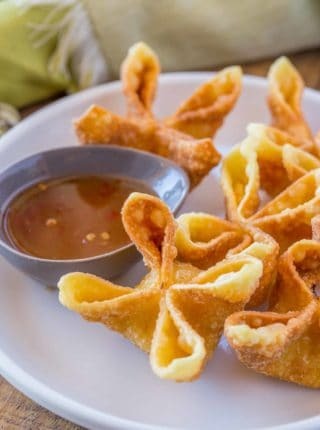 You can definitely add that back in if you would like, but with just a coat of cornstarch (or flour if you prefer), you will still have a completely delicious dish. I made it both ways at home for the same meal so we could compare, this version won by unanimous decision. We normally serve this P.F. 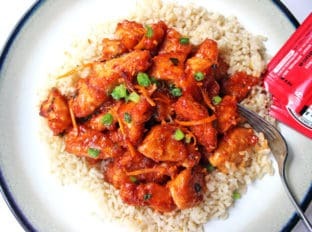 Chang’s Orange Peel Chicken with Perfect Brown Rice, Every Time and Roasted Garlic and Ginger Carrots. If you’d like to try out another P.F. 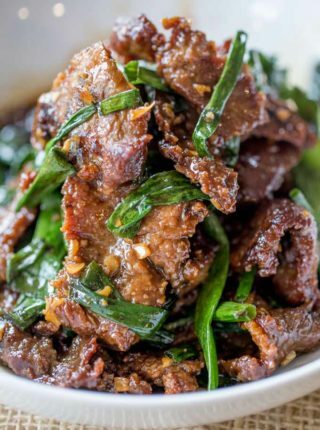 Chang’s favorite you should try my Easy Mongolian Beef which is a delicious and easy copycat of the original! P.S. Did you know I’ve recreated every Panda Express recipe on the menu? 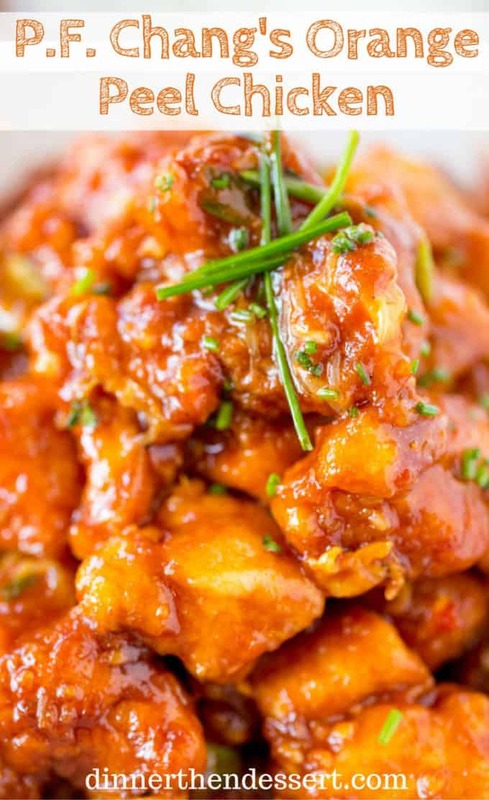 Head over and check out all the copycat recipes now! Sriracha: Quite possibly the king of all pre-made hot sauces as far as I’m concerned. Adds heat without overwhelming you and can be used in almost every cuisine. Try mixing with mayo to make a perfect spicy mayo! Citrus Zester: This zests your citrus perfectly without getting any of the pith in the recipe. 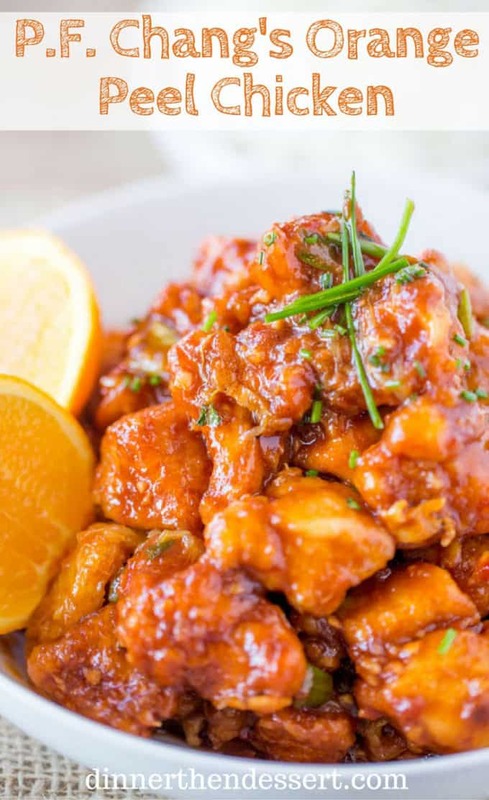 Spicy and sweet, with notes of orange flavor, this Orange Peel Chicken is a healthier version of the PF Chang's favorite! Cut the chicken into 1 inch chunks. Put in a bowl and coat with cornstarch. Add two tablespoons of oil to your wok. Heat oil on medium high and add the chicken. Remove chicken from pan. If you have about a tablespoon of oil in the pan go ahead and use it without wiping your pan clean. If not, add a tablespoon of oil, minced garlic and green onions and let cook for about 1 minute, but don't let your garlic burn. Add tomato sauce, water, sugar, Sriracha and soy sauce. Bring to a boil and then simmer for about 5 minutes or until the sauce thickens. Add the chicken back into the pan with the sauce. Top with the orange zest and orange strips and mix until all coated, letting it cook for another 20-30 seconds for the chicken to heat back up. 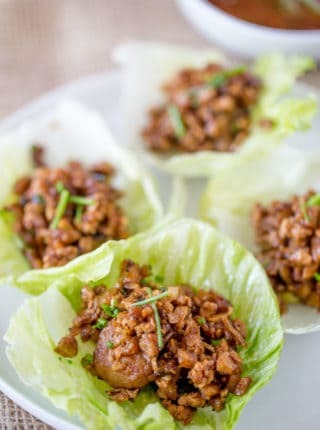 Serve with Perfect Brown Rice, Every Time and some Roasted Garlic and Ginger Carrots. I did make a few changes. I squeezed about 2 oranges and added it to the sauce as well as put the orange zest so it could simmer. I thought it added more of a fresh orange taste. I made this last night and it was really delicious! I did everything exactly as stated in the recipe. Thanks for a delicious one! ? This is just amazing.. 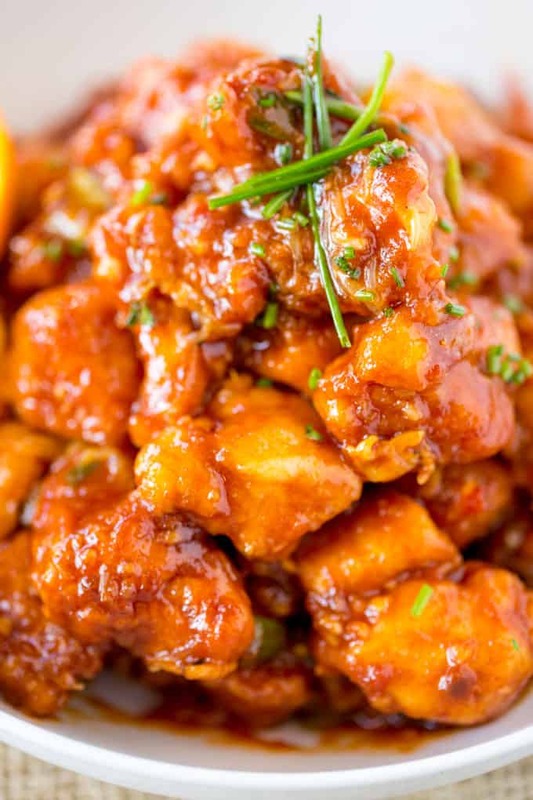 I have been eating PF Chang’s orange chicken my whole life and this was by far better in my book! Excellent recipe!!! I will be making again! and again.. and again.. and again.. and again.. Thank you so much for the nice compliment! This recipe was delicious! I was a little skeptical when it didn’t call for any orange flavoring other than zest so I did end up adding a splash of orange juice before the sauce began to simmer. We accidentally bought sriracha mayo so we used a tbsp instead of regular sriracha. Our family of 5 with a 13 yo, 2yo, and 1yo ate every bite! I’m so glad you guys enjoyed it! I know how hard it is to please everyone at dinner. Thanks for coming back to let me know! Wow, just made this tonight and it turned out AMAZING! Thank you for such a great recipe, I will definitely be making this often! 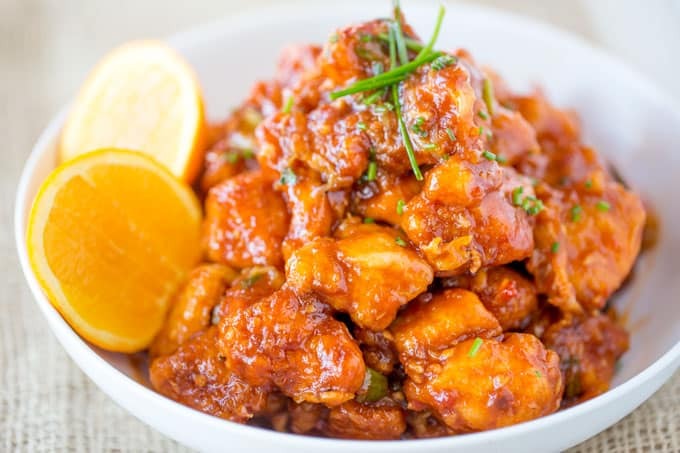 I used to love the orange peel chicken at P.F. Chang’s until I found out it contained mushroom and oyster sauce (I am super picky, I know) so I am thrilled to have found a substitute. Like others have mentioned I was nervous about the addition of the tomato sauce– but it turned out wonderfully. My husband says he wants me to make this every week! Yay!! Such an honor to be put into weekly rotation!! 5 star recipe, as always. 1 star website. Why is there ALWAYS a window playing the audio to the embedded video on every recipe? I can’t listen to music while having your page open because the embedded videos auto-play for a recipe I’m not making. This can’t possibly be monetized, so what gives? That is a fault in the video player, not at ALL intentional. I’m forwarding it to my tech person. Thank you for letting me know, it hasn’t done it to me. Glad you enjoyed the recipe though!